First impressions matter. Your website is likely to be the first “member of your team” a new visitor will come across: so, what impression does yours give? From the moment they land on your homepage, a visitor is forming opinions about your business. If there are outdated entries in the blog, broken links that throw out error messages, or slow-working pages that take forever to load, it only takes a nanosecond to lose a prospect’s attention before they move on and search elsewhere. I’ve seen this figure as low as 57%, going to 65% and reaching as high as 90% during research: the point remains that a huge proportion of a buyer’s interactions with your brand and decision-making process is done before any dialogue actually happens with a human at your business. At ESM Inbound, we cater to all sorts of website requests – from content creation to optimising product pages, and adding smart features to personalise each visitor’s journey. We are able to perform these one-off tasks or provide you with a brand new, fully designed and developed website. For many customers, that means creating a fully functioning site optimised for growth using GDD best practices. As Forbes, highlights, it seems nonsensical to put all your energies into the second part of the buying process – the sales pipeline – without first acknowledging the essential part your website is playing. And just because you have a website, it doesn’t necessarily mean it’s working at maximum capacity for you. This is where Growth-Driven Design comes in. We aren’t saying it’s for everyone, but if you’re determined for your website to act as your best salesperson, it’s time to consider GDD as a realistic option. What is a GDD website? 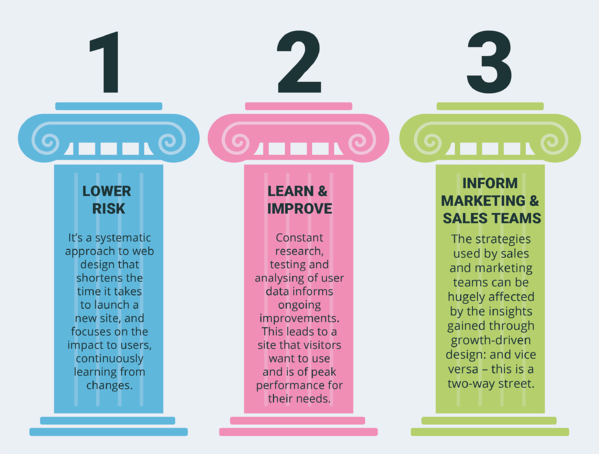 Growth-Driven Design is an alternative to traditional website design. Instead of building a full website which takes six months or more, on average, to build with very little direction to improve, a GDD website makes smaller, incremental changes to the site over a period of time, meaning positive results can usually be seen within 60-90 days. GDD puts users at the heart of your website. Instead of relying on what you think you know about your customers, and building a whole new website around these assumptions, GDD looks at data, user behaviour and wider research to build something beautifully tailored to your customers’ needs. 1. Its adaptable and ever-changing abilities: These make a GDD website an excellent salesperson. Imagine if a human employee had a skill set and attitude that enabled them to constantly evolve, review and adapt to customers’ wants and needs: you’d never want them to leave. In this same way, a GDD website enables you to do so much: trial, change your mind, and go in a new direction in the way that a traditional website redesign doesn’t. 2. Your GDD website is a good listener: This is something we could all do with. Below, the pink line represents how a GDD website is built, vs how a traditional one is implemented. The small incremental steps made to adapt a GDD site respond directly to user activity; by trialling small changes day by day, businesses can listen and respond to how visitors are behaving on the site, altering features as necessary until they work. 3. 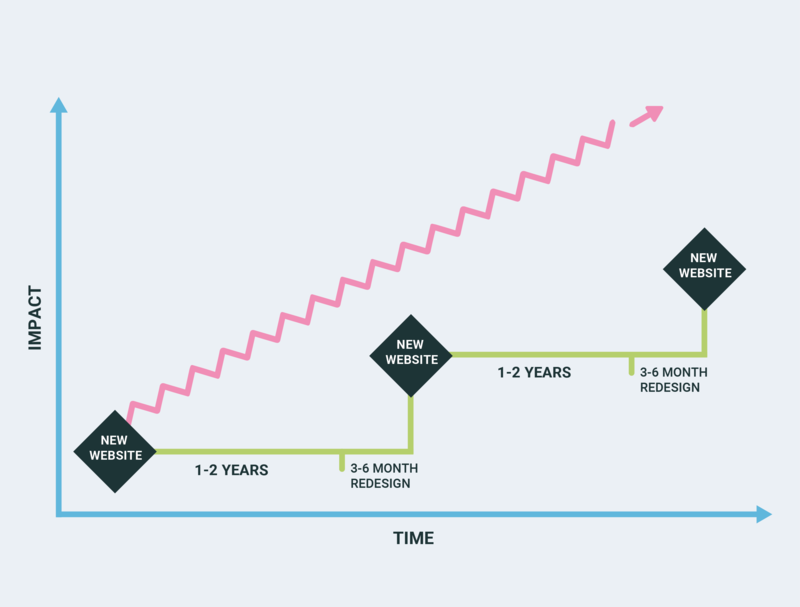 It’s cheaper, quicker and more flexible: The green line represents a more traditional approach where all the decisions about a new site are made at the beginning, implemented, then stay that way until the next website overhaul in a couple of years. This less flexible approach means a business is putting all their eggs in one basket at the start of the redesign in the hope that it will work. This also often means large upfront costs, commitment and more likeliness of deadlines overrunning: not something any of us wants from a salesperson. GDD lets you minimise risk – both financially and emotionally. With tiny steps of progress there’s more transparency and less need for a huge upfront commitment. Increased chances for experimentation – rather than a fixed idea of what your website will look like from the start, a wish list allows you to highlight all the changes you want to make, prioritise them and gradually introduce them. Beginning with a launchpad website – rather than a traditional “set and forget” model, means you can constantly tweak and adapt your site. The initial strategy stage and launchpad site development takes just 30-45 days – it’s easier to stay within budget, on deadline and crucially, start seeing positive effects. UX and tweaking – GDD is all about user experience (UX). There are regular opportunities worked into the GDD cycle to review the user journey and create a friendlier, quicker, simpler interface. GDD follows a cyclical pattern – typically with regular monthly reviews. If you’ve set yourself a target of spreading the redesign over a year, the following 11 months suddenly feel far more manageable and less daunting. Using weekly/bi-weekly sprints – you’re constantly testing and reviewing your site’s optimisation, so it feels like a productive learning journey, rather an unrealistic, out-of-control quest for perfection before anything gets launched. Content audits are conducted early on – this helps to use as much existing content as possible, while also seeking gaps on the site that need filling. 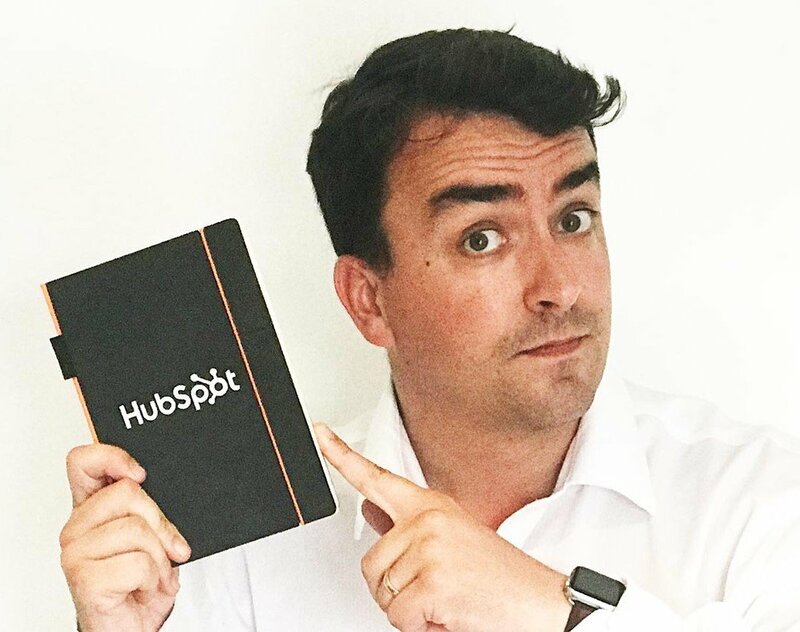 Smart content enables personalisation – one of the most powerful features of the HubSpot CMS is that content can change, based on your knowledge of the visitor. This includes showing different text to prospects and existing customers, changing images based on a visitor's location, showing a different page to mobile visitors, and creating forms that only ask questions you don't know the answers to. If you think you might be interested in trying a new website using Growth-Driven Design, ESM Inbound can help you through the entire process.